The students living south of Center Street and east of 2050 West (Geneva Road) over to 1920 and 1860 West need to cross 2050 West (Geneva Road) to travel towards the school on roads with sidewalks. We as a school community request a crossing guard be placed at 2050 West on the northeast corner of 400 South along with proper school crossing zone signs. This crossing guard can then cross students on the northeast corner of 2050 west to travel west along the north side of 400 West where there is sidewalk all the way to 2530 west. Students will then cross 2530 West with the crossing guard in front of the school at 200 South. Students living in the area south of Center Street and east of 2370 West walk to 180 or 230 South and then travel west to the south side of 200 South. 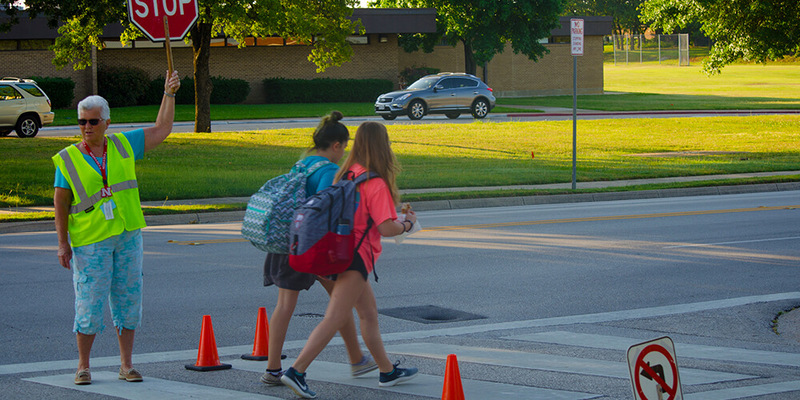 We request a cross walk be striped and proper signage be placed at 200 South, crossing 2530 West on the south side of the road, to allow students to cross safely to the school block. Parents who drop off students at school in grades 1st through 6th will use the new east drop off zone along the old faculty parking lot and exit drop off area on 280 West. Parents with students in kindergarten will use the drop off zone in front of the main doors and exit back onto 200 South. School buses will be dropping students off at designated areas in front of the school at the northeast corner and also at the area west of the school. 2050 West (Geneva Road) is a highly trafficked highway and there is no sidewalk on the west side of 100 north block. Therefore, students living on or near 2050 West are to walk north to 300 North and continue westward on 300 North, southward on 2200 West, then directly to the school from there. The 100 South, 200 South, and 300 South blocks on the West side of 2050 West are another area of concern. Those students living on 2050 West are to walk south on 2050 West to 400 South, then continue directly to school on the side walks which travel through the new developments.